I used to have my Christmas cards filled out, stamped, and addressed very early, before Thanksgiving early sometimes or the first week of December. The last 2 years I decided to make my cards, however, that never happened, and here I am just like last year, scrambling at the last minute to fill out, stamp, and mail out cards that I went and bought. I am sitting here in my craft room, 30 minutes and 4 cards into the process. 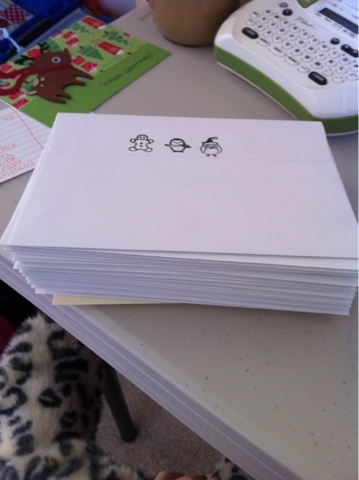 I am frustrated because the envelopes aren't sealing... My thoughts "Oh, good tape, I'll tape them closed". I do this for a couple cards then think, "Tacky! Oh, holiday stickers! I'll use those!!" So I dig them out, "That's better!". Now here I am, 3 hours later, they are finished! I just have to pop 'em in a mail box. Christmas cards almost didn't happen this year, unfortunately that was the 2nd set I bought. The first set all the envelopes were sealed.. At least these ones were not! So glad I'm done, and hopefully there's no procrastination next Christmas. 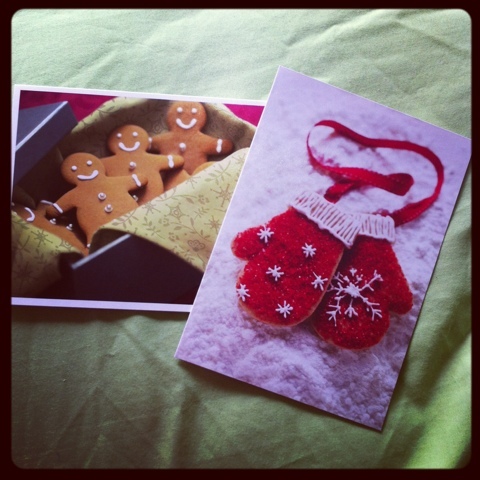 Those Christmas cards are the cutest! Found your blog through the blog hop. I'm a new follower. Hope you'll stop by sometime!